The Joint Commission has accredited Orchard Place since 1989. The Joint Commission's accreditation is recognized nationwide as a symbol of quality for behavioral healthcare providers. To earn and maintain accreditation, Orchard Place undergoes extensive on-site reviews at least once every three years and yearly internal performance reviews. These reviews evaluate our performance in areas that affect our quality of care. We are scored on over 800 standards, including the safety of our buildings, use of seclusion and restraint, administration of medications, the effectiveness of Treatment Plans, record keeping and staff credentials. By seeking accreditation, we challenge ourselves to continuously improve our services and hold ourselves to a nationally recognized standard. You may review our current accreditation status by going to QualityCheck.org and typing in "Orchard Place." If you are an Orchard Place employee and have unresolved concerns about the safety or quality of care provided at Orchard Place, you may report these concerns to The Joint Commission. Orchard Place will take no disciplinary action because an employee reports safety or quality of care concerns to The Joint Commission. For more information, click here to visit the Joint Commission Web site. 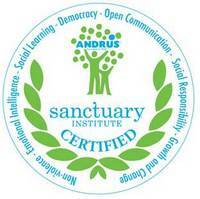 Orchard Place is the only organization in Iowa to have received Sanctuary Certification. Sanctuary promotes safety and recovery from adversity by utilizing a trauma-informed care approach to organizational change and treatment. This model recognizes that just as humans are susceptible to adversity, organizations themselves are equally as vulnerable. We saw how this model helps people bounce back and recover from the challenging things that happen to them. We know that people need supportive relationships to be healthy. Sanctuary teaches us how to build and use these supportive relationships so we feel supported. Sanctuary helps children and families see all they are capable of finding solutions for a better future. Who can help if you need it? The Sanctuary Model originated in Philadelphia in the early 1980s, created by Dr. Sandra Bloom and her colleagues. Dr. Bloom was a featured speaker at the 2014 Trauma Informed Care Conference that was sponsored by Orchard Place. Over time, the model has been adapted for a wide range of human service organizations.